CISF Constable Fireman Results 2018, Cutoff Marks & Merit List : Central Industrial Security Forces (CISF) has organized the Constable (Fireman) examination on 15th July 2018. Lakhs of hopefuls seeking to get Constable posts in the nation have competed for the CISF Constable posts. The organization has conducted this examination in several areas. Hopefuls have given the test with great aspiration to get the job as constable. The organization has also made accessible of the answer keys of the examination soon after the test completed. All the candidates estimated the score by comparing the answers are right now keen to check the results. The CISF is expected to release the results soon. Stay connected to the CISF official Website, cisf.gov.in. The result, cutoff marks, and merit list are expected to release shortly by the authority. Here we will update the date of results soon after the organization’s announcement. Central Industrial Security Forces (CISF) is the national level organization that annually releases various notifications to hire the suitable aspirants into various posts. The organization has recently announced constable (fireman) posts. As per the notification, 898 posts. Many of the hopefuls across the nation have shown interest in CISF Constable posts and applied during the announced dates. The organization accepted applications from the aspirants and the selection will be done through various rounds such as physical eligibility test, written test, interview/GD etc. candidates have to score the best merit in these selection rounds to get shortlisted for the announced posts. 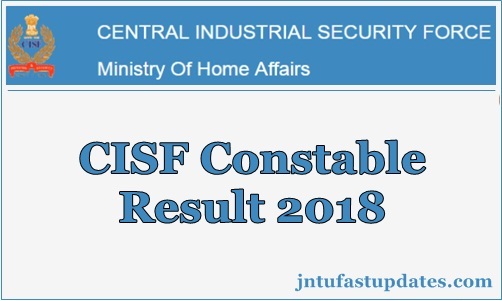 The organization released the CISF Constable Result. Candidates can stay checking the CISF official portal, cisf.gov.in to download the result. Along with the result, the CISF also will release the cutoff marks and merit list of qualified aspirants. Candidates who have come across the examination can check the details at the time of result declaration. Aspirants names mentioned in the merit list are said to be shortlisted for next rounds of selection process. The organization will release the merit list based on one’s qualifying marks. Candidates have to score above the qualifying marks/cutoff marks to get shortlisted for the merit list. Stay checking the CISF website on the frequent basis to download the merit list, cutoff marks, and results. Soon, we will update the CISF result release date here. Stay visiting our page for latest updates. Cisf.gov.in & cisfrectt.in is the CISF’s official Website. Make a visit to the web page and search for the CISF Constable Result 2018 download link. Enter the login credentials to download the result. The result will be downloaded and the cutoff marks will also display on the screen. Mera naam bi ni hai list mei .